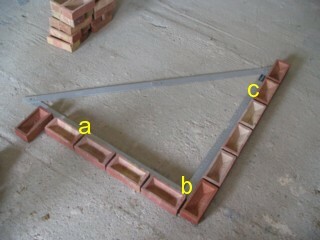 pointing tool such as an iron or pointing trowel and a tape measure. 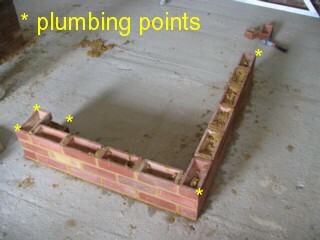 first set out a dry bond with your bricks as in the picture, now if you dont have a square you can use the 3,4,5 method of obtaining square, to do this you can just mark a straight line on the floor using your level as a straight edge to a multiple of 3, so for example draw a line on the floor from point a to point b at say 600mm in length, from point b measure at right angles a distance of 800mm and make a small mark, the distance between points a & c should be 1000mm if you have square. 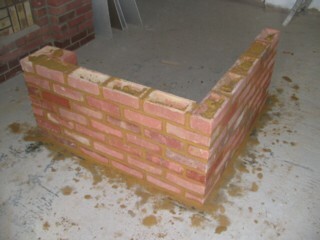 because we dont want the brickwork to set permanently we are using lime with the sand at a ratio of 6/1 6 parts sand to 1 part lime, once you have your mixed mortar on your spot board we need to practice turning and rolling out the mortar, (see rolling out tutorial). it would be a good idea to repeat this exercise a couple of times as there are quite a few plumb points with the corner , the pier and the stop end. the second time you cover this exercise start to use a string line, if your not sure how to use a string line we will cover this and the use of profiles on the training course.